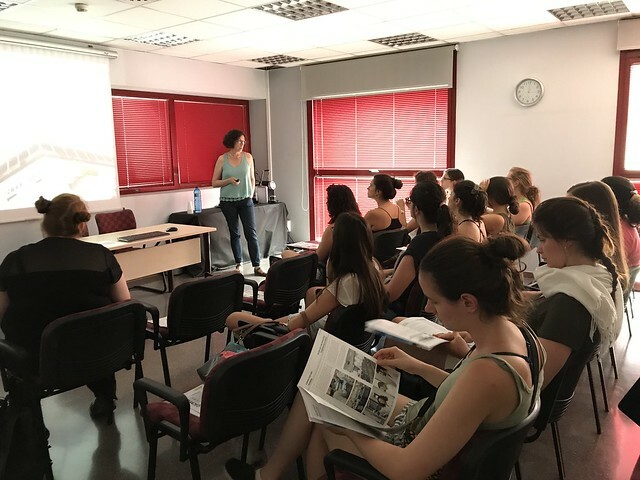 ICMAB hosted on July 2017 an afternoon lecture and visit of thesummer school in physics, a bilateral exchange program for young female physicists in the transition phase to Master or PhD studies. Firstly, Rosa Palacín introduced the Institute to the female participants, which came from Freie Universität Berlin, and from the UAB and UB. Next, Anna Roig explained her career path to become a scientist, and her research in nanoparticles for brain therapy. She also asked the young students what were their interests. After that, the participants could visit some of our laboratories, including the AFM laboratory, with Andrés Gómez, the Low Temperatures and Magnetism Lab, with Bernat Bozzo, the Nanoquim Platform (clean room) with Marta Riba, and the TEM lab with Judith Oró. This summer school "Diversity in the Cultures of Physics" was held for young physicists at Universitat de Barcelona, Universitat Autònoma de Barcelona and at Freie Universität Berlin. In 2018, the same summer school will be for students from UB, UAB andUppsala Universitet. The aim is to facilitate the transition from master to PhD and to open up transnational perspectives for a career in physics. Want to know more about how physics is shaped by gender and diversity Female students are eligible to apply for an Erasmus scholarship to cover the costs (travel, accommodation, food) of the school. Lectures and visits to physics research groups. Follow a local research group / perform a mini-research project with a local group. Contacts to equality-oriented institutions and activities at the universities and cooperating institutions as well as in the national associations and foundations. Lectures and discussions on gender & science studies.